Just two and a half weeks until the marathon and I’m ramping up for a big mileage week. Since I was set back last week my final long 20 mile run will be this coming weekend. Then I’ll taper down to the marathon. So far my hip is feeling fine. 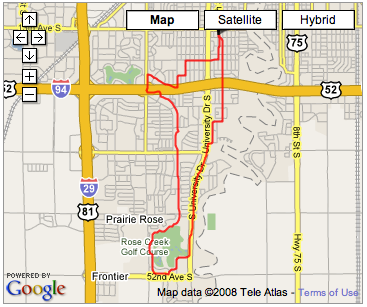 I had a really great 10.76 mile run this morning at a 8:49 pace. Pretty good clip for me. It was chilly, about 42 °F, and windy (20 mph). But I felt pretty comfortable after a mile or two. I’m excited to finally run my home town marathon to its fullest. I’ve also signed up for the Manitoba marathon in June and the Twin Cities marathon in October. These two muscles are located in the front of the hip joint and I think I have strained one of them. Unfortunately it is at the wrong time with just four weeks left until the Fargo Marathon. I think I was a bit overzealous on Thursday running 10.5 miles at an 8:14 pace. That evening my hip was really annoying me and on Friday I could not even walk without extreme pain. Well the muscle is healing and I managed to get out for a very easy 2 miles today. I could tell I’m not 100% but it has improved a lot. I’ll take it easy this week and will probably have to push next weekend’s 20 mile run back a week. That should still give me two weeks to taper before the marathon.